When abortion doctor Kermit Gosnell made headlines more than five years for his filthy clinic and appalling practices, even many pro-choicers were horrified. Cat feces littered the floors. Bloodstains covered the furniture. The smell of urine was everywhere. But it was Gosnell’s medical practices that got the most attention. Untrained staff administered pain medication. Gosnell snipped the spinal cords of babies born alive – babies who otherwise could have survived at a hospital. And a woman had died in his clinic under his care. Gosnell later was arrested, prosecuted and sentenced for his crimes. A new movie -- Gosnell: The Trial of America's Biggest Serial Killer (PG-13) – recounts the horrible details of his actions. It stars Dean Cain (Lois & Clark) as detective James Wood, Sarah Jane Morris (The Night Shift), as assistant district attorney Alexis “Lexy” McGuire, and Earl Billings (Antwone Fisher) as Gosnell. 1. It’s disturbing … but not too graphic. How do you make a movie about an abortionist without showing abortions? You do so by spotlighting the trial. 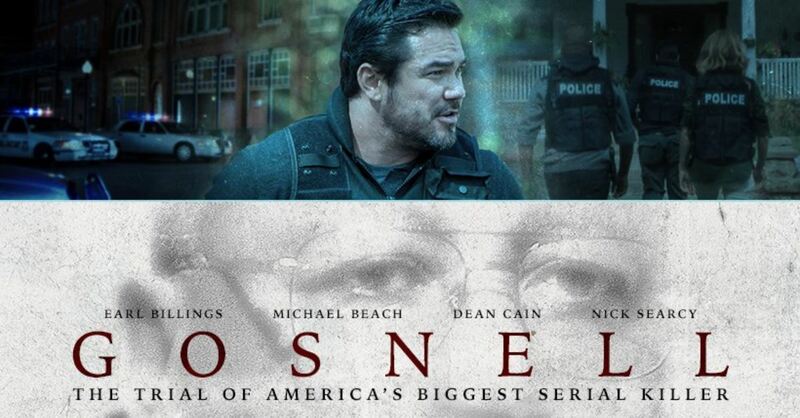 The movie opens with Gosnell’s clinic under investigation and soon transitions to his arrest and trial. Thus, you won’t see recreations of abortion scenes, even though you will hear them described in excruciating detail. It further earns its PG-13 rating with a few disturbing images, including those of unborn baby feet (in jars) and heads (on a table). (We see only the tops of the heads, which are set to be cut open as part of the investigation). It contains mild language, too. 2. It uncovers the horrors of abortion. Abortion has remained legal in the U.S. partially because it is hidden from the public’s view. Thus, we never hear about the late-term procedure dilation and evacuation (D&E), which involves injecting potassium chloride into the unborn baby to kill it, and then dismembering it piece by piece by pulling out an arm, a leg, and so forth. But in Gosnell, we learn about abortion procedures like D&E when a female abortion doctor takes the stand for the prosecution. It’s an education that America needs. Kermit Gosnell would not have been prosecuted if not for a handful of pro-choice prosecutors having the courage to take the case, even though they knew the public debate would morph into one on abortion rights. The district attorney in the movie warns his assistant and the detective: “You are prosecuting an abortion doctor for murder. … You know how it will play in the media.” They brought the case anyway, solely because they knew it was the right thing to do. We need more prosecutors like them. 4. It exposes the loony legal logic. I’m grateful that a group of pro-choice prosecutors took the Gosnell case to trial. What Kermit Gosnell did was horrifying – and against the law, too. But while there is a legal difference between what he did and what takes place in abortion clinics throughout the country, there is no moral difference. This becomes obvious when the female abortion doctor is asked by the defense attorney: Hypothetically, what would you do if the abortion was unsuccessful and the fetus accidentally was born alive? Her answer: Keep it warm until it dies. The attorney retorts: It would have been more humane to snip its spine. Remember the debate over partial-birth abortion? It was a legal procedure in which the baby would be partially delivered feet-first, and its brain suctioned while still in the birth canal – guaranteeing it wouldn’t be alive. That procedure was banned by Congress, but other procedures – just as morally problematic – have replaced it. Rated PG-13 for mature thematic content including disturbing images and descriptions.